Can a girl really have too many shoes? The answer is a definite, "No!" There is always a new colour, a new style or a new pattern that necessitates expanding one's shoe collection. So it should come as no surprise that when Brantano requested to work with me, I accepted with glee. I had to chose a pair of shoes from their current season's range. Not an easy task, given that they have a wide range of brands to choose from and a great mix of colours and styles. In the end, I settled for these super soft and utterly comfortable pair by Clarks. Or, Clarks Cloudsteppers Sillian Rest Ballet Pumps Casual Shoes, to give them their official name. As their name suggests, they are casual pumps for everyday use. They were exactly what I was looking for to get me through this summer. I have been walking the school run in them, and my feet are happy. I love how the shoes combine style with comfort. The black fabric contrasts beautifully with the light grey straps and detail. The 'cloudsteppers' is the combination of a lightweight, flexible sole, a cushion soft instep and stretchy elastic straps. All three things work together to make my feet comfortable. I chose a size 6 in standard width D, and they fit my wide feet perfectly. There is enough give in the shoes, so a width E might have been to loose for me. The experience of shopping with Brantano was faultless. The only time lost was me trying to decide what pair to choose. Once I had settled on my pick, I had them delivered within a matter of days. There were multiple options, from free delivery for a minimum spend to paid for, named day delivery. They came neatly packed and were well presented. And there was the offer of free returns, which I did not need. Here are my feet, all comfy in my new shoes from Brantano. Don't they look happy? And they go so nicely with that grey sequined top I talked about last month. 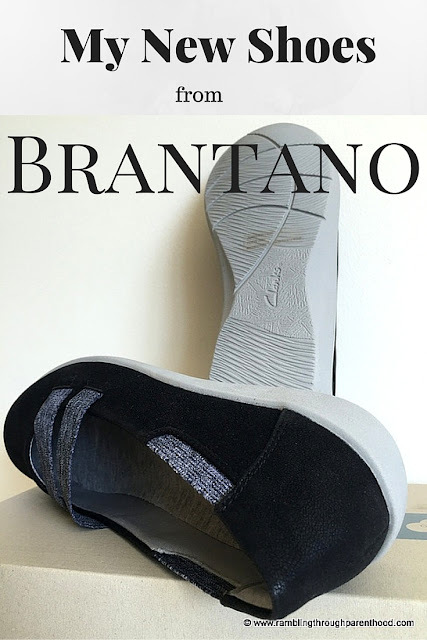 The Brantano website has a sale currently on, and they also do kids' school shoes. Two very good reasons for you to pop over for a browse. Disclosure: I was sent a pair of shoes for the purpose of this review. All opinions are my own. I love shoes! These look great and so comfortable! They look so comfortable - I should really invest in some comfy shoes myself! I really love these shoes, I'm making a bid to walk more so I could use something a bit more supportive like this! I love the name and these shoes look super comfortable! They look very comfy! I need some comfy shoes like these, although I don't go to clarks or shop with brantano a lot, I'll have to look at them some more! They look really comfortable. I love the color as well - looks cool.